This is my second time attempting a PDF pattern garment. The first was a Burda dress and let’s just say it didn’t go too well. Just looking at pictures online doesn’t give me a sense of whether something will look good on me… I find when I’m in a fabric store and I can take out the pattern instructions and look at the shape of the pattern pieces, I can get a better sense of whether I’ll have fitting challenges. Today, I’m attempting the Colette Sorbetto. It’s free, it’s simple, and it’s what I need to fit under my Burda 6801. I’ve purchased a white rayon and I’m going for simplicity. The first thing I did after printing and assembling the pattern was trace it out onto Burda tissue paper (if I sound like a Burda fan-girl, I am, and I don’t even get paid to be). I’ve traced the 18, because in Big 4 patterns I’ve been making 18-20 for the top and 20-22 for the bottom lately. However, I just checked the Colette sizing chart and realized my measurements (bust 41.5″, waist 36″) make me somewhere between a 14-16 so I’ll watch my sizing carefully and be prepared to take things in, or give healthy seam allowances. I’m planning to use French seams for this. What’s with the shoulder seams not being aligned? I have the pattern pieces pinned to my centre front and back on the straight grain. The bust point is obviously a bit higher on me than the pattern model, so I’ll have to redraw the bust dart. I’ve marked a dot where my bust point is (thanks to my Uniquely-You dress form) and where I think the dart should stop to avoid dimples. The Colette patterns are drafted for a C cup, so fortunately there seems to be enough fabric here around the circumference of the bust. I might redraw the armscye so it provides a bit more coverage, because once I’ve done the bias binding, this will probably come a little further down than is necessarily appropriate or flattering for work. Onwards I go to fix these things… Will update the post later! Well, the trip to Europe is done, and I am home. Thanks to international travel and jet lag, I snagged myself a nasty cold on the day of my return and have spent the past three days in bed or on the couch. I thought when I got back I would focus on finishing the black dress I wanted to wear to the Top 20 Under 40 Gala, but after I tried it on again, I realized it was looking very Becky-Home-Ecky so I’ve put it in the naughty corner. Also, I need a dress I can wear with flats because after two weeks of walking on cobblestones, my knees are wrecked, and high heels just won’t do. So now I’m taking a pause from sewing while I consider my next endeavours. Doing the Patternreview.com Wardrobe Contest made me think about my sewing projects in a coordinated, purposeful way for the first time ever, and I’m pleased with the outcome. While I was in Barcelona, I spent a fair amount of time poking into little designer boutiques in the El Born district, where you can easily get lost and/or drop hundreds of Euros on adorable locally-designed garments, if only you are a size 12 or smaller. This made it a tad frustrating for me, because even the most adorable outfits were ruled out based not on price but on sizing… They just don’t make clothes for the tall, athletic and slightly rounded Canadian girl. One thing that did dawn upon me though, after seeing some stuff in boutiques that frankly I wouldn’t consider fit for public viewing: there’s not that much separating me from people who design and sell clothes for a living. In skill, that is. I can totally rock the garment construction. The question is, can I put together a design concept and take it from idea to a collection? The other big part of my European trip, from a sewing-design perspective, is my experience in Paris. I’ve already written about my amazing Chanel adventure, but what I haven’t mentioned is our visit to the Musee D’Orsay in the morning, and how it inspired me to sketch things I don’t know that I’d ever make for myself. It’s made me wonder whether sewing only for myself is limiting my exploration of my creative abilities. There’s of course something empowering about interpreting fashion design concepts for a slightly plus-size woman, but I’m starting to see how it can be liberating for designers to think about how clothing could work on a person with minimal curves. If you didn’t have to factor in worries about over-emphasizing your hips or bust, what would those clothes look like? Also, there are colours I wouldn’t want to wear personally but am inspired to use in garments – grey and yellow, for example, which look terrible on me but on someone with different colouring could be stunning. So, all of these thoughts are bouncing around my head at the moment as I recover from being ill and survive what promises to be a brutally over-committed next seven days. By next weekend I’ll probably be exhausted and hopefully pining for my sewing loft. Until then… Netflix and chill! Getting up this morning was quite arduous. Actually, the problem was that I couldn’t sleep past 4am, so I tossed and turned for an hour, then fell asleep again and snored like a lumberjack for a while. Our morning destination was the Musee D’Orsay, to see the Rousseau exhibit as well as other impressionists. We used the metro to get there and saw Paris rush hour commuting – jam-packed trains! Fortunately we were able to skip a few trains to get on some that were less crowded. We emerged at Solferino and did what the Parisians refer to as “window-licking” at a boulangerie and patisserie. I’ve never seen meat so lovingly arranged with roses as decoration – say “I love you” with meat! There was some kind of demonstration about to begin, with people dressed in surgical robes parading past, holding signs that we couldn’t quite make out. We asked one protestor what it was about and could only make out that they didn’t want to be treated or paid like pigeons. Well, who can blame them, right? The lineup for the Musee D’Orsay was quite daunting at first sight but it moved fairly quickly. It was about 5 degrees and a bit windy but there was sunshine and interesting people to watch. We were there at 10am and inside by 10:20am. Simon is NOT a lineups person. The Musee D’Orsay is an impressively beautiful building. It’s an old train station made over into an airy art museum with little “compartments” for each of the galleries. There was quite a crowd around the famous exhibits like Van Gogh’s Starry Night (pretty darn beautiful – loved the deep blues). I felt a bit overwhelmed with the camera and sketch book, trying to capture ideas and images, while keeping an eye on Simon who was quickly bored. Giving him a camera to use helped amuse him for a while but the old Sony camera gives up the ghost every so often, causing frustration. There were some limited attempts at art education (“this is what Orientalism is about”) so maybe when he’s older, some of it will have stuck in his head. What I noticed about the art is that I much prefer art styles which have bold colours and outlines, like Toulouse-Lautrec’s work, and Picasso’s stuff (not much Picasso at the D’Orsay but it appealed to me). Henri Rouseeau’s work in the feature exhibition appealed to me as well, for it’s naïveté in interpreting shapes, faces, etc. He painted with bold interpretations. It didn’t have the delicacy of the impressionists like Monet and Degas. There was depth even though he didn’t try to paint with perspective to give the effect of dimensionality. Apparently my vocabulary for writing about art is fairly limited, so I’ll leave it there. I did have lots of ideas for fashion which were inspired by the Rousseau exhibit, although nothing that would really be right in my own wardrobe. I can see now why Project Runway gets designers to go see art to be inspired to create fashion. Ideas were popping up for looks that I don’t even know if I can find fabric for – ahh for a trip to Mood! After the Musee D’Orsay, our plan was to go up to Place Madeline and find lunch. We rode the L’Open Tour bus across the Seine and got off at Place Concorde, then walked up the road past Maxim’s which was of course waaaaay out of budget. There weren’t any affordable lunch places around there, and Simon’s foot was bugging him no end. Artos suggested that he take Simon back to the hotel for lunch and a nap, leaving me to my desire to visit the Chanel headquarters at 31 Rue le Cambon. Great idea. After orienting myself on a map, I began picking streets that I expected would get me the Chanel place and fashion district. I popped into a little hole-in-the-wall discount fashion place and found it full of Le Crap Tombe Avant Le Lorry. A few doors down was a juice bar/organic food place packed with Les tres chic persons. I picked out an orzo salad and ordered a “Mango Mama” juice, which came to 11 Euro. Eating like a chic Parisian is tres chere. I people-watched while I ate and tried to figure out whether Paris has made the slightest effort towards waste diversion (no, everything goes in Le trash, even in a trendy organic place like that). Moving on to my big adventure… 31 Rue de Cambon. It’s a very quiet one-way street with a few other tiny boutiques, but mostly offices. It’s very peaceful. You could walk right past the Chanel location and hardly notice it if you weren’t looking. At first I stood across the street and took pictures looking upwards towards the top of the five-story building, where the workrooms are. Then I decided to be bold and go inside. It is, after all, still a store – just without all the storefront merchandising of a high street shop. Ahhh here I must pause and begin reliving the memory. I don’t want to miss a single detail or get it wrong in the retelling. When I came in, the two security guards at the door welcomed me. Straight ahead, there is the beginning of the shops – more on that later. I turned right, where through a gap in the wall I could see … The staircase. The guard on my right beckoned me through. There it was! Coco Chanel’s famous staircase. Mirrors line the wall along the stairs, and it widens at the bottom with a delicate flare. It’s not at all like a grand staircase you’d find in a hotel or fancy mansion. It is simply a beautiful, feminine, warm and welcoming entrance to a home. As I stared up at it, the security man watching me greeted me. I wish I had an on-board camera in my mind for what unfolded here, as I can hardly believe my luck. We started out with the man, whose name I don’t actually remember (not sure he told me), offering to take my photo at the bottom of the stairs. I just had my camera with me for pictures. I thought it would be a quick snapshot and on I’d go to the shop. He wanted to get me in just the right spot, though. I pretended I was Coco Chanel coming down to greet the press. He showed me on the picture how the mirrors on the wall turn the opening of the staircase at roof level into a heart shape – the staircase is the heart of Chanel! He asked if I knew where the staircase led, which is of course to Coco Chanel’s apartments, now used by Karl Lagerfeld as his offices. From there, I said, we go up to Les ateliers, the workrooms where the haute collection is made and the pret a porter collections designed for the shows. I guess this bit of knowledge on my part revealed I wasn’t just your regular kind of tourist. That’s when he stepped up the stairs and beckoned me to follow him. Sometime before this point, he had asked me where I was from, and upon learning I was Canadian, he complimented me on our Prime Minister (thanks Justin! Way to create opportunities for Canadians to live their dreams!). My friend is Kurdish, he tells me, and is so grateful that Canadians have sent troops to fight ISIS. I didn’t have the heart to tell him we were not all united behind that war, because he was so gracious about it. He also complimented my hair colour. He said he came to Paris 22 years ago to find work, and had begun as a security guard here and was now head of security for the building. Uhh wow! Good person to meet! So, back to the staircase… Up we went to a pristine and sun-filled room with white couches and white-and-black decor. It was welcoming and warm rather than stark as you might expect from a white and black decorating scheme. This is the place where Chanel’s couture customers come to see the collection in private shows. Through a hallway to the right, there is another smaller chamber with a sitting room and mirrors. Hanging in cabinets leading to that chamber is the current haute couture collection. There it was… Amazing, glowing, soft. The garments were hanging behind glass, but my friend opened the doors and pointed out the hand-beading. Hundreds of hours go into each of these garments, every seam worked by hand, even the trims and beads prepared for Chanel by exclusive specialists in their trades, in the buildings around this district. The fabrics of the jackets, made by Linton Tweeds in the UK exclusively for Chanel, showed gleaming silver and gold threads woven through the wool. My friend opened each cabinet to show me the work on the various garments, and then invited me to touch the beading on one of them – glass beads, not plastic, each hand-assembled in rosettes before being stitched onto the sleeve. I just about died right there, really. We took a few pictures of me dying of ecstasy in front of the haute collection, as well as sitting in the chambre privee, scanning the look-book which contains images of the entire collection. As my friend said, this is where princes sit to watch their princesses try on clothes. He even joked “would you like to try one on?” But I am absolutely certain he didn’t mean it. (Besides, they don’t make Chanel samples in a size 16). Sounds in the nearby rooms made us wrap up our visit and go back downstairs, but not without taking some pictures of me descending the staircase as if, you know, I was just going out for a coffee and planning to come back again later. On the way down the stairs I gushed about being so inspired and excited by the visit. I said I was a beginning designer, and he seemed interested so I pulled out my sketchbook and showed him some of my better sketches (the ones with colour added). He was very nice and encouraging, which was kind. I figured I’d better stop before I completely embarrassed myself so I invited him to visit Canada at his next opportunity, and said farewell. Floating on a cushion of dreams, I walked through the boutique taking mental note of the Chanel trademarks, the interlinked C’s and the gold lions which are a motif throughout Chanel. There were shoes, handbags, sunglasses, scarves, and of course perfumes. At the back of the store there were three rooms where the Spring Pret a Porter collection is displayed. People were sitting on low couches with private shopping attendants guiding them through catalogues. I floated around each room taking note of the amazing details and beautiful fabrics. One simple white shell top had the price tag poking out so I looked… 1,870 Euro! I touched one of the dark blue Chanel jackets to feel the softness of the fabric, and how light it felt, quilted to the lining. No stiff interfacings here! Wanting just one thing to savour from my visit, I went into the cosmetics area and was relieved to find there was something within my price range, loosely – a lipstick is a mere 34 Euro! Huzzah! I chose a colour fairly close to what I normally wear, and a very sweet and gracious salesperson put it together for sale with me. Buying a lipstick at Chanel involves adding your name to their customer register, so I am now in the Chanel customer list! It comes with a sample of Chanel Mademoiselle perfume, and various bags from the tiny one for the lipstick to a larger handbag-sized bag for the purchase to be carried in. A separate room contains the cashier, who offered that I could pay for the purchase in Canadian dollars (no, I didn’t calculate the exchange rate – brain was not functioning analytically). I got a separate sample of the Rue de Cambon perfume and all of it packed up in gracious, smiling, lovely service. I walked out of the shop feeling like I was in a dream. Have to leave things here to get ready for the train to Barcelona… To be continued, including my experience with fabric shopping in Montmartre! What do you do when your hair is BLUE? You wear BRIGHT orange and blue clothes, of course. 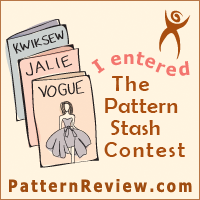 In this case, it was all part of my Pattern Review Wardrobe Contest adventure (contest rules here in case you’re interested). This contest started February 1 and ends March 31 (but I am leaving on vacation March 20, so I had a shortened time frame to complete). The idea is to make a ten-item coordinated wardrobe with two tops, two bottoms, 1 topper, and 5 free choice items. 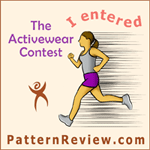 Everything has to “go with” everything else, and of course everything must be sewn during the contest dates. As things went along, the colours of fabric I had in my stash weren’t really lining up with these colours, and I was afraid to make the palazzo pants. (There: I said it. Orange palazzo pants are nice in theory on a skinny model, but on me I think they would be clown-like). And then sometime in early February, I watched the movie “Inside Out” and fell in love with the hair on character Joy. Wouldn’t you? I thought to myself: my hair kind of has that shape… on a good day… a very good day. What if I dyed my hair blue? Wouldn’t that be fun? And since I’ve never done anything remotely adventurous with my hair before, aside from cutting it pretty short, I decided to go for it. And once I had blue hair, well there was no holding back on the wardrobe. It HAD to be as bright and joyful as possible, while also being comprised of things I could actually wear after going back to a normal hair colour. I only bought three pieces of fabric specially for this wardrobe, and the rest were from stash and at least six months old. Well, the striped cotton was from someone else’s stash and acquired at a stash swap. But free. The fabric I bought was the graphic knit print, the cotton jacquard for the skirt, and the denim for the pants. It turns out the denim was narrow and shrank more than expected, so I wasn’t able to make wide-leg pants at full length. Ergo I invented a new pants style – wide-leg high-waters! Wheee! And of course, what you’ve all been waiting for, is the pictures from the photo shoot. Click on any image to see it larger. Many thanks to my awesome co-worker Helen for taking these photos, and the lovely Aeryana for scouting the location and doing model coaching. Normally I feel like a prat while modelling, but this was a lot of fun! This is another rendition of my simple top block with a drapey collar added in to it. In this project, I re-traced the pattern pieces because they were starting to get a little wrecked. I lengthened the front and back and then added pockets to the side seams because who doesn’t love a dress with pockets? The fabric is an orange heathery knit, and it’s lined in simple knit lining. The collar isn’t lined, it’s just cut and folded. Front of dress. The top of the bodice got a little wrinkly where I put the lining and outer fabric together with a sleeve hole binding. Here is the collar. It’s a shaped pattern piece, wide at one end and narrow at the other, cut on a piece of fabric that is folded in 4. Maybe one day I should properly analyze this pattern to see what it would be like to make it available as a PDF. Gah that sounds like a lot of work though. And it’s not really what I’m doing this for, anyway. Project Review – Self-Drafted Outfit! My past two projects have been self-drafted garments – a pencil skirt and a knit top with a draped collar. I don’t know quite how to describe it, so I’ll just post pictures. Oh yeah… There’s something a little different about my hair. As you can see, I got some blue boots. Here’s the neckline of the top. I drafted this top about five years ago – in fact, the first time I made it was December 2011. I put sleeves on it that time. This is the 6th version. Some of them end up with sleeves. One became a dress with a fabulous Pucci-esque print. Anyways, this is a simple tank top out of this terrific print. The skirt is a cotton jacquard. Photographs don’t do justice to the jacquard pattern. It has some stars and flowers and a variety of great vines and other wonderful things. I’ve lined it with a crepe of unknown fibre that was in my stash. Putting the lining together with the walking pleat at the back was really hard. I had to re-sew it by hand three or four times before it would hang properly. Anyways, this outfit is the epitome of what I’ve been trying to do with my Seasonal Sew Wardrobe in blue and orange. The other pieces haven’t yet lived up to my expectations, but I’ll keep trying. Onwards towards the Seasonal Sew Wardrobe! Here is my second project in the capsule wardrobe of ten looks which I’m attempting to complete by March 15. I’d say it’s 50/50 as to whether I’ll finish things. Today’s project was Burda 7082, a dress that looks like it has a wrap front (but it doesn’t). When I was putting this together on the dress form, it really looked like it was going to turn out sad, droopy and awful. I’m using a deep blue textured knit from stash. I don’t normally wear this colour, but I bought it when I acquired the heather / leaf knits that I used for the cardigan sweater. A crossed-over bodice is often challenging to fit properly so you don’t end up with sagginess or gaping which ends up showing off more of your ladies than you’d like. With the addition of some non-stretchy interfacing (Armo Weft) along the facing, I think I have succeeded with this project. Close-up of the crossed-over front and the criss-cross front detail. Thanks to the weird lighting in front of my door, this actually makes me look as pale and stiff as a mannequin. Odd. 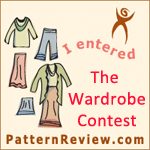 I’m embarking on a capsule wardrobe for Spring 2016, which I’ll use on my trip to Europe in March and enter into the PatternReview.com Capsule Wardrobe contest. I’m using fabric which I bought last fall with the intent to make a dress from it, but I found it wasn’t quite right for the patterns I was looking at so it was languishing in stash. Here’s the cardigan pattern I picked up over the Christmas holidays. McCalls 7254. This is a hybrid of View B, using the contrast fabric, and view C with the long sleeves. Although working with this kind of sweater knit can be really tricky, the fabric turned out to be okay. I did a fair amount of pressing, which I normally wouldn’t do on sweater knits. I incorporated some knit cut work which I’ve been just dying to use, but the challenge was I was supposed to interface those pieces. I ended up using the regular knit as the inside (facing) so I could interface it with a fusible. I used a black knit fusible to try to keep it light, and I like that it doesn’t really show through. I thought I’d share my pattern organizing system, which I think I got out of a Threads magazine quite a few years ago. Catalogue envelopes that are about 7.5 X 10.5 inches (hard to find in stores nowadays unfortunately – I order them online). Every time you get a new pattern that you know you’re going to want to keep, take the pattern pieces and instructions out of the original envelope. Put them into a catalogue envelope and write the pattern number on the outside. If your patterns have names, write the name. You can add some details like date acquired, basic pattern description etc on the catalogue envelope as well. These envelopes go into a box or filing cabinet, ordered numerically or alphabetically. You can fit a lot of patterns together in one box if you never have to worry about browsing them. That’s where the next step comes in. The pattern envelope, with the drawings and fabric requirements, goes into a sheet protector. I actually cut the envelopes open, trim off excess white space, and tape the back beside the front, so all the info is on one page, before inserting it into a sheet protector. Then I can put two patterns into one sheet protector. All the sheet protectors go into a three-ring binder, divided according to pattern type, so you make your own pattern catalogue. You can do the same thing with PDF patterns by printing out the pieces and a photo to accompany it. Pieces in a catalogue envelope, drawing/photo in your catalogue binder. Each time I use a pattern, I take the pattern envelope in the sheet protector and the pattern in its catalogue envelope out to work with it. When a project is finished, if I’m going to use the pattern again, I’ll write what I made with it on the outside of the envelope that stores the pieces. I can note any adjustments made, the date I used the patterns, and what my weight was when I made it to fit me. That way if I use a pattern again after many years, I’ll know whether it’s going to “fit right now” or not. I’ll also note on the drawing/original envelope what size was cut, when it was made, and how well it worked. I can put re-drafted pieces and un-used pattern pieces back into the catalogue envelope as well, since it is larger than the original envelope and less prone to ripping or disintegrating. I have lost count of how many patterns I have, but by looking in my very own pattern catalogue I can compare looks and basically “shop my inventory”. I also keep a record of how patterns were used or changed over time.